These posts report on the progress of my comic books, or feature information about them. When I first saw the Up Goer Five comic by xkcd, I loved it. It epitomised what I do with my comic book and my research, and is a convenient example to show people, when explaining the idea of constrained vocabulary writing. Fans figured out that the 1,000 words used by xkcd for it were the contemporary fiction list, shown in Wiktionary. This frequency list is based on over 9 million words of on-line contemporary fiction. It combines plurals and simple verb forms into one listed word (lemmas), which is a good choice, since if the root word is known, then the plurals with s, and simple verb forms are usually also understood. As someone who writes using lists generated based on frequency, I’ve noticed that several problems arise. One is that, typically, male pronouns and nouns occur at higher frequencies than female ones. The Wiktionary list is not overly biased in this way, possibly because it is based on contemporary fiction. “he” is ranked at 8, “her” and “she” at 12 and 13 respectively, and “his” at 16. However, we find “man” at 163 and “woman” at 452, but “girl” is at 133 and “boy” at 217. This hints at what has been termed the systemic “infantilization” of women in society. The figures are probably quite different due to the common pairing of “guy” (at 178) with “girl” in colloquial speech. Google’s auto-suggest, which is also based on frequency, has occasionally come up with phrases that are considered racist, sexist or otherwise problematic – and it is purely a reflection of what we as a society tend to write. When writing in a principled manner for language learners, it may be important to balance what word frequency lists tell us, with what is a more equitable representation. I didn’t really think very much about this when I started writing Gnomeville years ago, but have become more aware of these issues thanks to some of my friends who are more knowledgeable in them. Another issue that needs to be considered is what is culturally appropriate to write for the target audience. For example, I have recently been made aware that it is inappropriate to use words referring to alcoholic beverages when the audience is Islamic. Obviously for work intended for children (or for experimental subjects) it is customary to exclude expletives. For this reason, several words on the list would need to be excluded. There seems to be an expressive set of expletives in the list. For the method of writing I employ in the Gnomeville story, I introduce one new high frequency word per page of story, and somewhat less frequently I introduce a grammatical pattern. Sometimes I’ve changed the order in which I add words due to the story. This happened in episode one, in which I introduced “se” very early instead of after about a dozen other words. Also, I recall that “le” was added before “de”, even though their ranks are reversed. Having said that, my first 20 words were based on a corpus of newspaper articles. Every corpus gives a different ranking of words. There are some similarities across corpora however. For example, if the corpus is large enough, the frequency of the word “the” is likely to be about 7% for English text. Anyway, back to Up Goer Five. The upcoming book “Thing Explainer”, as well as the text uploaded to the up goer five text editor provide some good practice at reading for people still consolidating their first 1000 words of the English language. If going beyond that, the writing should have less than 5% of words outside the vocabulary set to be suitable for improving language skill while fluently reading for comprehension. A text editor with more flexibility is the OGTE Editor, designed for writing English text for different language learner levels. It’s always nice when someone wants to buy your products, especially when they have taken a lot of work to create. My first comic book (+ CD) was sold on Friday. This makes me happy. Gnomeville Episode 1 is done! Having given myself a hard deadline of Friday so it would be ready for launching at a concert of French music, it is done! 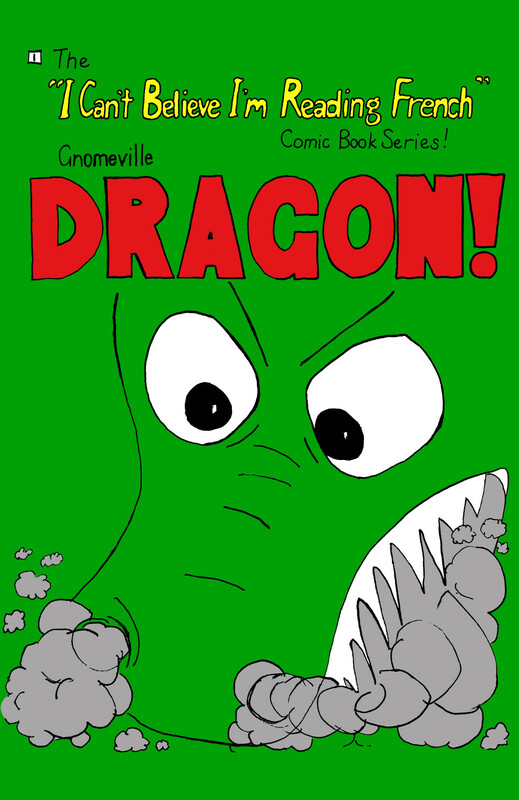 The “I Can’t Believe I’m Reading French” Comic Book Series, Episode 1: Gnomeville: Dragon! 28-page booklet plus audio CD containing 3 stories in comic book format, a crossword, a song and a language summary. Assumes no prior knowledge of French but a native or near-native English speaking background. Introduces 12 of the twenty most commonly occurring words in French newspapers, one new word per page of the Gnomeville story. Uses the words that are common to French and English to ensure that all words in the stories are familiar, such as “dragon”, “gnome”, “arrive”. The Fido story provides further reading practice, ensuring each target word has been read at least 5 times. The Taxi story is a nice easy story to read after the other stories. The audio CD contains the stories read by a native speaker, plus two songs related to the stories. Currently only available from me directly, but stay tuned for updates.